Wow. 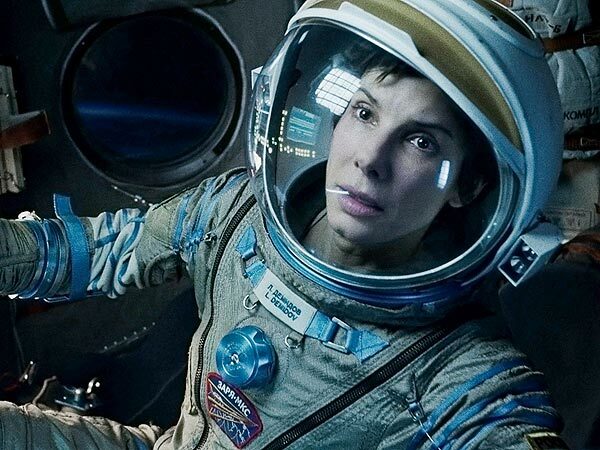 When an actor’s face is the greatest special effect in an effects-laden extravaganza the scale of “Gravity” you know they’re going to get tremendous momentum in their career. And when you’re already an Oscar-winning actress – the skies the limit. Look up! That’s Sandra Bullock in the apex of her incredible career soaring overhead. I was blown-away by her performance as will anyone who watches the hot new space-genre film. I’ve always enjoyed Sandy in her comedic vehicle and her breakthrough role in “The Blind Side” but they were all well-within her girl next door comfort zone. Gravity, on the other hand, is well-without the actresses normal, terrestrial canon of work. This time, she took on the role of her life – one that required her to convey and carry the weightlessness of space at the same time the incredible pressure of a woman living moment to moment in the face of almost certain death. The fact that she pulls it off is utterly incredible. Not because she isn’t an incredible actress – it has more to do with mastering her craft in literally every frame of film she is in – which she does and then some. However, that’s not the best part, The best part of watching Ms. Bullock is the sheer rapture of seeing a woman in her absolute prime. Sandy is gorgeous in this film because she is not only beautiful, but willing to show all of herself; her vulnerability, weakness, indecision in depicting a character that is broken emotionally – only to come back from the brink again and again…then again. She is beautiful and in command the way Greta Garbo was beautiful and in command. You fall in love with Sandy over the course of the film and begin to wonder how you never realized what an amazing talent she is. And such a beautiful, seductress of cinema. I was so struck by her performance – I actually began to think of how wonderful it would be to “know” Sandra Bullock; a little daydream in the middle of the movie that only invested me more in what was happening to her character on film. How magical is that? So, here’s to Ms. Bullock’s 2nd Oscar nomination and win! Nothing is absolute – but I will bet anyone she will be nominated for yet another breakthrough performance and possibly the most understated, compelling and engaging role of her career. The movie is really that good. And Sandy Bullock transcends the material into more than the sum of it’s blockbuster parts – she really does defy gravity in Gravity! Wow. Here’s a second to your Oscar nomination buzz! Bullock’s performance was emotionally (and physically) tremendous – I was blown away. Great post!